About Zagreb, recommendations for restaurants, things to see, activities, shopping places and accommodation options are listed. 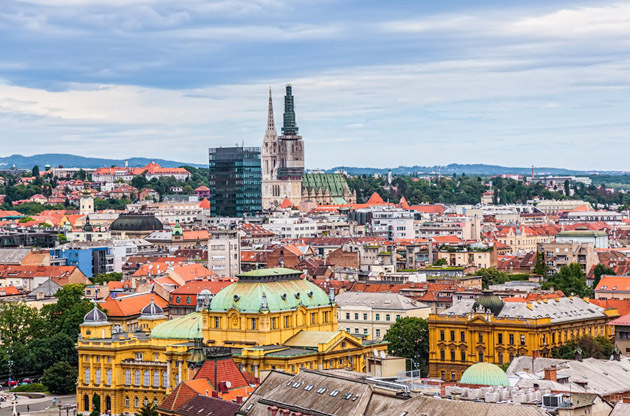 Located in the central part of Croatia, Zagreb is only a few hours away from the countries such as Slovenia and Austria. There are numerous legends about this city and its development. According to one of them, a thirsty governor of Zagreb told a girl Manda to take some water from Mandusevac Lake: “Zagarabi vodu” or “Scoop it up!”, and the Zagreb was born. The first appearance of the name of this city is dated to 11th century, and the city became a capital of Croatia in 1776. Today, Zagreb counts over 790.000 citizens and that number is getting bigger every day. Zagreb is the seat of central government, as well as all government ministries and embassies. Besides, because of very good transport connections, headquarters of all major companies in Croatia, scientific institution and media are located in this city. All the major events and fairs take place here. As a capital city of Croatia, Zagreb offers to its visitors the opportunity to catch a lot of cultural places. Museums, parks, gardens, theatres, cathedrals and squares – all of that you can visit are here. If you want to have an active holiday such as hiking or skiing in the winter, you can visit Sljeme Mountain, a host of world known FIS cup. Along the Sava River is located Zagreb, in the northwest of Croatia. If you are coming to Zagreb by plane, you can use public transportation to get in the center of Zagreb. Depending on the traffic crowd, you can be there in 30-35 minutes. If you want to use Taxi at the airport you will find a lot of taxi companies that will take you to the place where you want to go. The main square in Zagreb is named after governor Josip Jelacic. This is the heart of this town. From there you can easily rich Opatovina Park, Cathedral settled in the Kaptol, or Upper and Lower part of the town. Lower part of town is well known by Green horseshoe - place of seven squares and botanical garden where you can enjoy in a beautiful surrounding. In Archaeological Museum you can find out how the Zagreb was developed and if you visit a Museum of Broken Relationships you will have the opportunity to see the impact of broken relationships on individuals. Visit The Croatian National Theatre and check if there is a performance to see. Besides, you don’t want to miss a chance to visit the Drazen Petrovic Memorial Center and find out everything about this famous basketball player's life. While staying in Zagreb you will want to see Maksimir Park and the ZOO. For only a few Euros you will see elephants, camels, snakes, Chinese three-striped box turtle and a lot of other animals. Zagreb offers a variety of gifts which you can buy and take home as a souvenir. You can choose between hats, T-shirts, mugs, umbrellas, and silk ties. Wines or rakija is your another option. Besides, you can always buy boxes of chocolate “Bajadera” and chocolate “Dorina” or “Franck” coffee. Nightlife in the city is very breezy. No matter which day of the week is, you can find a lot of places to spend a wonderful night. There are various numbers of coffee bars, discos, as well as the cinemas where you can watch midnight premiere. The cuisine is similar to those in Medimurje and Zagorje region. Barbecued lamb, salted fish in olive oil, chicken, baked salty cheese strudel are only a minor part of a restaurant menu. If you like something simple, you can always grab pizzas, hamburgers or leafy meat-pie. If you want to spend a day in the breathtaking surroundings, Thermal Spa Jezercica in Donja Stubica can be the right choice for you. Only 40 minutes away from Zagreb, you can enjoy swimming, panoramic view saunas, or in delicious food specialties. Samobor is a beautiful town offering old buildings, museums and parks surrounded by breathtaking hills. If you visit this town in February, you can attend the famous International Carnival. Try famous donuts and desirable Samobor custard slices. Situated on the northwest part of Croatia, Varazdin is touristic place that you must see. This small picturesque city has rich historical, architectural and cultural heritage. Here you can see buildings and museums from the Baroque and Renaissance period. In August you can attend Spancirfest – a festival of good emotions is taking a place, and in September Varazdin Baroque Evenings – a festival of classic music. Every year, a remarkable number of delegates come to Zagreb, the capital city of Dubrovnik for global gatherings such as conferences, congresses, trade shows, exhibitions, fairs and symposiums. The rich historical and cultural heritage creates an inspiring setting for business or academic events and each year, Zagreb puts its signature to more successful events.